Post written by I-Chen Wu, MD, PhD, from the Division of Gastroenterology, Department of Internal Medicine, Kaohsiung Medical University Hospital, Kaohsiung, Taiwan. 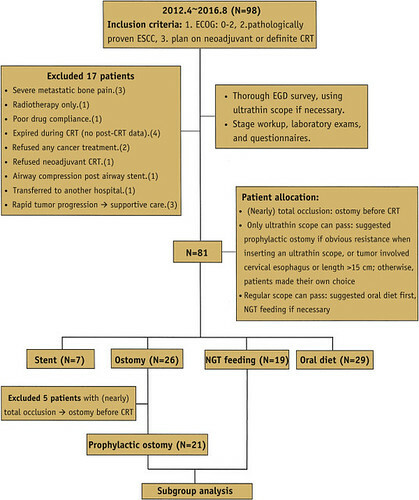 This study prospectively evaluated esophageal squamous cell carcinoma (ESCC) patients who received chemoradiation therapy (CRT) to compare the efficacy, safety, and quality of life among patients using different methods to maintain enteral nutrition. Prophylactic feeding ostomy is a common practice for ESCC patients undergoing CRT. However, procedure-related morbidity can delay treatment and some patients rarely use it. When dysphagia and odynophagia worsen during CRT, a nasogastric tube (NGT) can be inserted directly or under endoscopic assistance without interrupting cancer treatment. An esophageal stent is another possibility, but no study has compared these 3 routes. Moreover, there is no rule for selecting the population more appropriate for nasogastric tube feeding. Compared with the other groups, the stent group had significantly worse pain as well as more decrease in albumin (-1.03±0.9mg/dL) and quality of life across CRT. Following our principle listed in the flowchart, the success rate of nasogastric tube insertion was 100%. Tube feeding by means of transnasal or percutaneous routes appear to be comparably effective during CRT, but both had advantages and disadvantages. The NGT group had higher narcotic demand and slightly worse quality of life. Two patients (7.7%) had ileus days after jejunostomy creation. 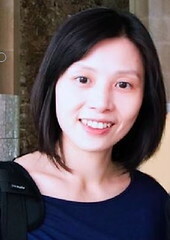 Five (19.2%) patients scarcely used ostomy feeding. Figure 1. Study flowchart. Inclusion and exclusion criteria and patient number in each group is shown. In subgroup analysis comparing prophylactic feeding ostomy and nasogastric tube feeding when necessary, 5 patients with (nearly) total occlusion were excluded. ECOG, Eastern Cooperative Oncology Group; ESCC, esophageal squamous cell carcinoma; CRT, chemoradiation therapy; NGT, nasogastric tube. We suggest a careful endoscopic evaluation, recording the cancer location, length, and severity of stenosis to select the population that could choose nasogastric tube feeding on an as-needed basis during CRT. A multicenter randomized controlled trial is necessary to compare the 2 routes in patients of moderately severe stenotic esophageal cancer who are scheduled to undergo CRT.